If you have any questions or want to enquire about dates, use our form to contact Kathrin Mair or see their website for more information. 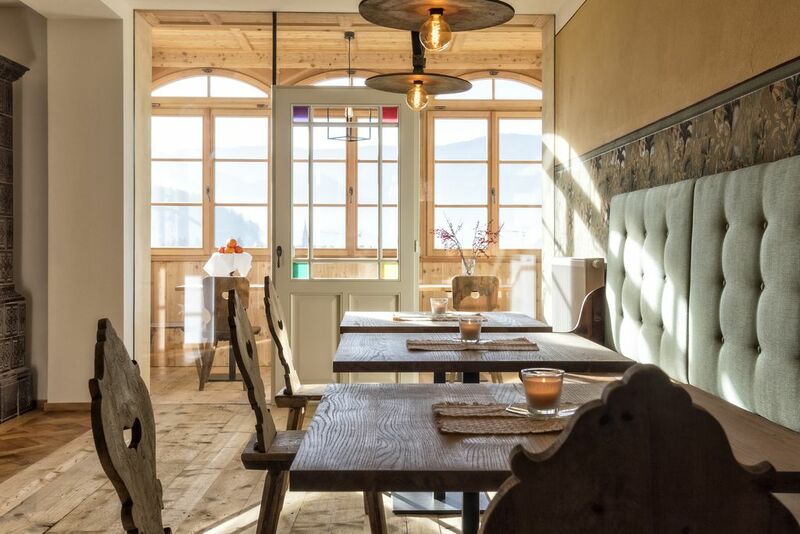 Up in the Italian Tyrol, here is a vast house – you could waltz round the hall – whose ingenious mix of old and new casts an instant spell: fields before you, mountains behind, creative touches, perfect detailing. Kathrin and Helmuth live here with their young children and are on hand to help. You’ll get a good breakfast at the communal table too: scrambled eggs, fresh bread, yoghurt, their own goat’s cheese, fruit, brioches and cakes – take it on the balcony if you prefer. With 14th-century foundations, the house has been in the Mair family for 200 years but was crumbling when the renovation began. They’ve saved the old structure, adding an annex, new staircases, big attic skylights – even a lift. It is hugely successful. Bedrooms are big, beds are family heirlooms with new bedding, lighting is subtle, designer sofas rub shoulders with old chests. (The attic room with its calf-height beams is for the agile only.) The top-floor sitting room has floor-to-ceiling windows and books galore. Explore Brunico and its museum designed by Zaha Hadid, go hiking, climbing, skiing in winter, return to the calm of this fine house. Minimum stay: 2 nights; 6 nights in high season. Whole house available. Parking on-site. Pets by arrangement. 27 August - 2 September, 26 October - 23 November, 19 December - 25 December. Packed lunch available on request. Restaurants 8-minute walk. Extra bed/sofabed €20-€40 per person per night. Have you visited Niedermairhof? Be the first to leave a review. While in the north, the high mountains of the Alps call out for mountain climbers, mountain bikers, and in the winter for ski tourers, that also occurs in the southeast from the majestic “pale peaks” of the Dolomites, an UNESCO World Heritage site. Messner Mountain Museum @Kronplatz between the Puster and Gader Valleys is devoted to the supreme discipline of mountaineering: the Trad Adventure Alpinism on which Reinhold Messner has left his mark. In Kronplatz You can enjoy the beautiful views on both the Alps and the Dolomites already by the uphill ride on the cable carwhich brings you to the top of Kronplatz. On the top there is a platform with a 360 paranoramic view on the surrounding mountains.